“Are your fingers frozen?” Blink. Blink. “Why aren’t you typing?” Blink. Blink. Blink. “Don’t you know what to create?” Blink. Blink. Blink. Blink. The cursor is a silent but pesky critic. Do you ever want to curse the cursor when you’re in a slump? You can’t write that lead. You can’t come up with the visuals to illustrate the story. You feel like you’re crafting the same content you did yesterday. Wait, or was that last week? You can’t imagine how to find another way to talk about your core topic. Well, instead of watching a mocking cursor, take a tip (or 27) from your fellow marketers on how they get out of a creative content marketing slump. LEGO blocks are great. The same blocks used to build a house can be used to make a Death Star. Get a bucket of blocks (use DUPLO if you want bigger ones). On each block, write one word or phrase that relates to your products and services: attributes, content themes, personas, customer challenges, stage in the buyer journey – anything that relates to your marketing. Color code them if you wish and start playing. Bring together random blocks, then look at the connections. Write them down. See if they can be brought together to create new content angles or ideas. Pull apart those blocks and start again. You can apply some rules too. For example, put together one persona-related block, one block about the customer journey stage, two challenge blocks, and one product block. The idea is to get away from the linear thinking and play around with different ideas and connections that you might not have ever thought of. All the combinations – and resulting ideas – can be examined and expanded to see if they can be viable. Search through your blog or other content archives for posts or topics that can be expanded, updated, or adapted. Expand an old blog post based on industry-wide changes. Update best practices content for a new year or season. Adapt a popular text-based post into an infographic, video, or tool. Revisiting old content refocuses the mind on an easily accomplished creative task, which then sparks new ideas to lift you out of that slump. Physically writing may be a little old school, but there is something empowering and motivating about it. Simply put pen to paper and let the ideas flow. When you’re consistently trying to use your creative brain power, it’s easy to hit a snag and become exhausted. Suddenly you can’t get yourself to produce any one complete thought because you are pushing your brain too hard. When this happens, take a mind break and experience a different type of creative environment. Visit a museum or a new coffee shop. Sometimes experiencing new scenery can bring about fresh perspectives and stimulate the brain. Bring in fresh eyes. This could be fellow marketers, friends, college students – anyone who’s creative, passionate, and willing to give you an hour of their day. Give a short overview of your company, what you’re focusing on, and anything else helpful. Then let them go. Don’t shut them down or tell them why an idea wouldn’t work. Write everything down, explore ideas that resonate with you, and let their enthusiasm re-energize you. Keep that list and reference it whenever you get in a slump. Then bring them in again. When I feel unmotivated about a project or task, I try to find one element of it that is unique and interesting. This can be tough, but typically one piece relates to my life or catches my attention. Once I’ve found that element, I research the heck out of it and focus on that concept. Even if this concept is only loosely related, it will generally pull my brain out of a rut. Coloring is probably one of my favorite ways to combat a work slump. Not only does it reduce anxiety, relieve stress, and increase my focus, it’s also fun and fosters a creative mindset. I have a few adult coloring books and a good set of colored pencils. Coloring brings you back to childhood, and we all know how imaginative and creative children are. Picking colors that bring the pages to vibrant life is therapeutic. After coloring for just 15 to 20 minutes, I feel re-energized, and I’m ready to start working again. Stealing ideas from wildly different industries or mediums has always been my favorite way to get out of any creative slump. I once based a plumber’s web design on a cool-looking bag of beef jerky. If you feel like you’ve exhausted topics, engage with your audience by creating lighter content. If you’re appealing to your customers’ emotions, they’re more likely to trust your brand. Get out of your everyday environment. Take yourself and a colleague (or your team) offsite for a brainstorming session. Make sure there’s no access to work emails or any of the other distractions that tend to dominate proceedings in the office. Even taking just an hour out of your day can fuel the fire and ignite ideas. I sell cars. There’s only so much traditional marketing my audience can hear before tuning out. I partnered with a local magazine and attend all its community events. We held one at a newer restaurant with a live DJ and set up an ax-throwing court set. Everyone had a blast. I did a Facebook Live video with the owner during the event on the magazine’s Facebook page and had a small audience. By the end of the night I had over 160 views and that doubled by the morning. We promoted the magazine and restaurant and all their followers with several shares. I set up Google alerts around the topics I am actively writing about. Every morning, I read through the articles to find relevant news pieces to associate with the content I am writing. I find pieces that inspire a competing opinion or provide insight into mundane topics. It sounds stupid, but I’ll force myself to write whatever comes into my head – even if that means that I’m writing about not knowing what to write about. Most of what I write is pure stream-of-consciousness nonsense, but more complex and concentrated thoughts start to appear that can be developed further. After a while, without even realizing it, the writing mojo is back. One thing I do to help keep my mind from reaching a creativity block is daily meditation. I use various apps, such as Headspace. They make meditation simple and effectively help me clear my mind from unnecessary noise, reduce stress levels, stay focused, and boost my creative thinking. We encourage our team to experience art, exhibits, events, store openings, concerts, etc. Good creative content is built out of the collective human experience and translating that via content that resonates with your audience. I like to switch up the format of my content. If I’ve been doing a lot of storytelling content, I’ll try an informative article instead. Even moving mediums can help inspire new ideas – try working on a video instead of a blog post. It could open up a whole slew of ideas. What works for me is to have work in progress (WIP) files on my desktop. There are folders that have pages with only single sentences or a few paragraphs. I have screenshots of things that have worked for other people. There are unpublished articles and cut-and-paste text from engaging emails and Skype conversations. In these WIP folders, I have hundreds of ideas, all in different stages of development. If I ever get stuck, I start to dig through them and find idea gems that would normally be long forgotten. Jason Lavis, managing director, Out of the Box Innovations Ltd.
Do your legwork upfront and you can make tweaks as you go. A researched editorial calendar built six to 12 months in advance will serve as a foundation for the long term, particularly when you’re extremely busy and have less time to think. I go as far as to incorporate target keywords and long-tail phrases into a column on my calendar so that some of the framework for a blog is built for use later. Make a list of something that isn’t to do with what you’re working on. Making a list is a great way to keep your brain engaged, while taking time away from the task at hand. The list can be anything, from your 20 favorite music albums to the worst films of all time, to a list of things you need to pick up on the way home. Creating the list actively stimulates your brain. Find a side project at work. Someone always needs help for a project that’s been put on the back burner or an impending issue. Tackling a different problem than your typical work projects was just the ticket. As a favor, I took on data visualization projects for a separate team and it transformed how I looked at my core projects. It gave me a new point of view, which spurred the creativity I needed. Scale back the operation and put more of an emphasis on quality over quantity. We usually publish three data-driven studies a week, but we sometimes scale back to one a week when things are slow. This allows us to really nail that one piece because we focus all our energy on the visuals, the writing, the outreach, etc. Whether you interview clients, vendors, or staff members, real conversations are an easy way to energize a lackluster campaign. Interviews often reveal new topic ideas, a different point of view, and, if you keep the interview format, even a new voice. Too many content marketers prefer to go it alone. When they run into a creative roadblock, they struggle to get around it because they aren’t willing to look beyond themselves. I find that looking at what other successful content marketing professionals are doing can really re-energize me and kick my creativity back into high gear. If you are struggling to find the right content ideas, ask for help from all areas of your business – customer service, HR, development, administration, etc. All these departments are just as involved in your business as you are and they might be able to provide the spark you’re looking for. I find that much of writer’s block or creator’s block can be avoided by scheduling time to ideate. I like to create one to two months of ideas at a time. It might be 50 ideas cut to 25, but the process is finished and the ideas are put on a calendar so when it’s time to create I’m off and running. See what holidays are coming up. If one relates to your business, consider creating a piece of content about it. For example, a solar installation company I work with celebrated National Sunglasses Day. It posted a picture of a dog wearing sunglasses to their social media to let their followers know about the national day. With all the funky holidays, there’s bound to be something to help get your wheels turning and get out of your slump. When I feel like I don’t have a creative bone in my body and I need an idea for content or a new product, I do the one thing that has helped almost every time. I hand-wash my dishes. I purposely do not own a dishwasher because I’m a creative publicity expert, internet marketer, digital product creator, and writer who always needs new ideas for products, articles, promotions, etc. Even if getting rid of your dishwasher is too big a commitment for you, at least one of these tips will help you break out of your creative rut. And, more likely, you’ll want to mix and match to find the best idea to fix each particular slump you encounter. And, above all, you’ll have a great comeback the next time that cursor mocks you. 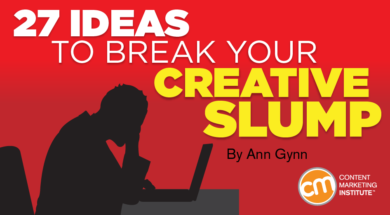 How do you break out of a creative slump? Please share in the comments. Get out of your daily routine and discover some fresh ways to look at content marketing. Make plans to attend Content Marketing World Sept. 4-7 in Cleveland, Ohio. Register today using code BLOG100 to save $100.